Today, thousands of websites and organizations are showing their support for net neutrality in hopes of preserving the open internet. Consider Engadget among them. 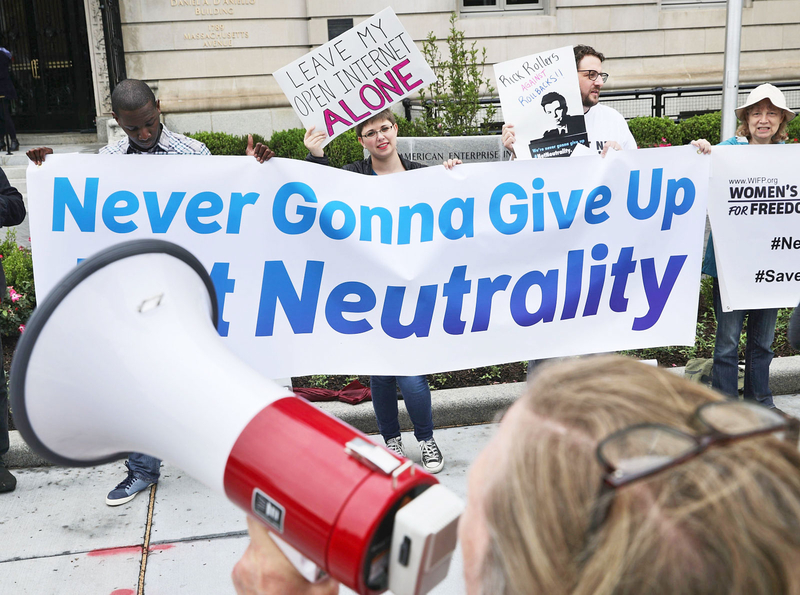 The Federal Communication Commission, as chaired by former Verizon lawyer Ajit Pai, is exploring ways to repeal the open internet rules put into effect by former chairman Tom Wheeler, and that's just not OK. I'm not just saying this as person whose livelihood directly depends on the internet. I'm saying this as someone who has loved and relied on the internet for almost as long I've been capable of love and reliance. The world we live in now is... strange, to be sure, but it's more closely knit and more prosperous because we've found meaningful new ways to connect with each other. For me, maintaining the quality of those connections means upholding the fairness of the network those connections happen on. That requires regulation, but Pai is in favor of undoing the internet's classification as a public utility under Title II, a move that would exempt the internet from stricter rules. Unsurprisingly, telecom giants like AT&T and Verizon (which came to own Engadget through a bizarre twist of capitalist fate) claim support for the open internet but disapprove of the Title II classification. I also don't think ISPs shouldn't be able prioritize, block, or slow down legal data as it flows to users. I pay to access the content of my choosing, not to have Verizon or any other company decide what I should read or watch and at what speed. That doesn't sound terribly outrageous or radical to me. But Pai is pushing to review the so-called "bright line" rules that prevent ISPs from throttling data or creating "fast lanes". Will they actually be struck down? Who knows, but Pai's public statements make it sound possible, if not probable. If it were up to me, that belief in the equality of legal data would be the first line in Article 1, Section 1 of the Constitution of the Internet. The FCC is officially taking comments from the public, but this doesn't come down to a public vote. The three remaining FCC commissioners will chew on their data and make their cases, and the Chairman Pai's agenda will almost certainly take effect. That's just how the process and the partisan math works. Moreover, FCC spokespeople have said that the process isn't concerned with the amount of support a viewpoint gets so much as the quality of legal arguments lodged in the official record. You don't need me to tell you that industry lobbyists probably have lots of strong legal arguments. And know that AT&T has spent just over $4.5 million on lobbying this year, while Verizon has shelled out just under $3 million. So yeah, the odds of the FCC coming out in favor of the existing net neutrality rules are slim. But that's no reason to give up. Remember: This isn't just about politics anymore. When President Franklin Delano Roosevelt pushed for the creation of the Federal Communications Commission in the '30s, he had no idea that a global network for sharing vast amounts of data over wires and through the air would exist, or that it would evolve and become irrevocably woven into the fabric of our lives. If you care about smartphones, if you care about gaming, if you care about streaming services and apps and software and the economic opportunities they have made possible, this is your problem too. This is a fight to preserve the internet as we know it, to avoid a future where the companies who control the pipes get to play favorites, deciding who sees what and when. This affects all of us. If we don't win this particular battle, legal action could potentially derail Pai's plans before they officially take effect. And if that doesn't happen, some future administration may still look favorably on the issue and shuffle the FCC's composition to make sure net neutrality is revived. The important things to keep in mind is that the fight for net neutrality might not ever end, and that we need to stay vigilant. If you agree, even only partially, please do something about it. Write your representatives, get your friends fired up and, yes, file a comment with the FCC. You have five -- five -- days to do so.